I love to make end grain cutting boards. They are more work, but the results can be spectacular. I limit my inventory, so that means I can only make new ones as old ones sell … and all of these are sold. 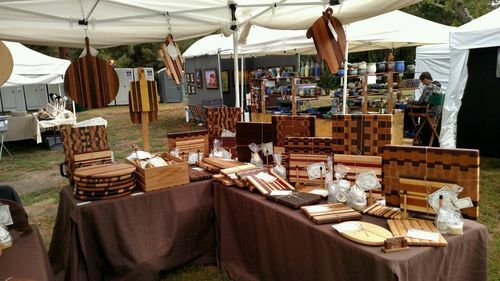 At our pop-up craft fairs, I carry boards only up to 16×20x1-1/2 … because I have to carry them to & from the craft fairs that we do (inventory humor! Coming at you!). 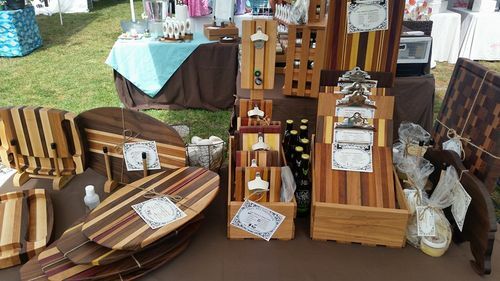 The first board was a commissioned piece based on another board that I made, but the buyer wanted a 20×24 with extra/larger juice grooves … so that’s what he got. He has now ordered 2 more boards for other members of his family. Typically, I put juice grooves on 16×20 boards, but generally do not put grooves on the thinner/smaller boards. And, no matter what I do, somebody will always want something different. That’s the reason I’m now carrying 150+ pieces to every show I do these days. And, yes, they are displayed in a 10×10 booth. Photo # 6: This design is a chaos board … meaning the design is not as rigidly symmetrical as my normal offerings. I get Mrs M to help put these together; I glue up 8 or 10 blanks, slice them, and then we go to town putting the pieces together in a pleasing way. These are not made with scrap, and they are very popular with my customers! - Sears Craftsman 10” saw with Woodworker II thin kerf blades & a Biesemeyer fence. It’s a bit underpowered … but it cuts straight & square after 10 years of steady use. All of my boards normally come with non-skid rubber feet, held on with stainless steel screws. Routed handholds. Finish is mineral oil, with a top coat of mineral oil/locally-harvested beeswax, AKA Board Butter. Always good looking stuff and yes people always want what you don’t have. I personally don’t care for juice grooves in patterned boards because I feel it disrupts the visual impact of the pattern. But I only sell ‘em, I don’t use ‘em. Very nice writeup and a lovely looking display. I would like to start doing this one day, but for now the weekends are taken up with babies. I have read and enjoyed your blogs. Thanks for all of the information and help. Excellent presentation and product. Hi – I have just about finished my first end grain cutting board and was wondering about what how to do the handles. I’m thinking of just routing on the bottom with a large rabbeting bit, maybe 4-5” long and in 1/2” or so? Yes, bglenden, I have done that on many boards. Watch out for burning … and you may find that a deep groove is not necessary. I’ve found that a depression for your fingers to reference is more important than actually getting a channel to put your fingertips into. My normal method, though, is to use a bowl bit and route out a space that’s perhaps 4” wide, 1/2” deep & 1” into the board. Note that when you’re routing an end grain board, tear out is a very real issue. I score the wood with a razor knife to the target depth; that minimizes (but does not fully eliminate) tear out. Nice looking boards. I just don’t know how to sell them. each is like a child of mine when I’m done, and I give it to a set of foster parents with a bottle of Howards. Well done congratulations on the sales. Love it.